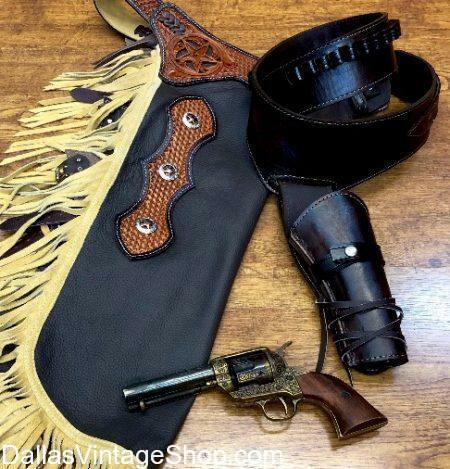 We have Supreme Quality Cowboy Chaps, Chinks, Replica Pistols, Gun Belts & Holsters along the largest and most diverse collection of Reproduction Old West Cowboy Attire and Theatrical Cowboy Costumes for Cowboy Western Reenactments, Outdoor Cowboy Festivals, Historical Cowboy Characters and School Projects. These Cowboy Fancy Chinks & Chaps are Real Leather with Real Leather Suede Fringe, Embossed and Stamped Leather Chaps with Texas Star, Decorative Trim and Conchos. We have Leather Cowboy Chaps & Vests that are perfect for Old West Historical Cowboys, Sheriffs, Gunslingers and Working Cowboys on a Wild West Cattle Drive. We Have Cowboy Gun Belts & Holsters for Old West Cowboys, Working Cowboys, Drifter Cowboys, Bronc Buster Cowboys and Old West Cowboy Movie Characters. We have a large collection of Old West Replica Pistols like the Cowboys and Outlaws of the Wild West. We have the Cowboy Outfits to match any Old West or Wild West Cowboy Lawmen, Legend or Cowboy Outlaw Gang. We have the Cowboy Authentic Style Britches, Banded Collar Shirts, Sack Coats, Long Coats and an unbelievably huge selection of Cowboy Western Vests. From Tone on Tone Paisley Cowboy Vests, Canvas Cowboy Historical Correct Vests, Handsome Leather Cowboy Vests, Wool or Cotton Cowboy Vests to the largest supply of Cowboy Large Bandanas, Cowboy Neckerchiefs, Cowboy Gentlemen Suits, Cowboy String Bow Ties and Old West Cowboy Ascots, we have more than you ever imagined. Nobody in the Dallas, DFW or North Texas has the Quantity and Diversity of Cowboy Outfits & Costumes than Dallas Vintage Shop. We are open all year round.